Places to see in Mandal Pushkarini: The region around the Mandal Pushkarini is covered with Sal plantation, the branches of which form a canopy. Stroll along the pathway under the shade of the canopy to explore the nearby attractions. Nearby attractions around Mandal Pushkarini: You need to travel for around 15 km. to view the 700-year-old temple at Bagri, nestled on the northern bank of the River Shilabati, which is a notable site around Mandal Pushkarini. The major spots of tourist interests around Mondal Pushkarini are the temple of Sarbamangala and the famous fort of Raikota. The fort features four main gates, namely Rauta Darwaja, Lal Darwaja, Hanuman Darwaja and Pesa Darwaja. The fort is admired with seven ponds on the northern side – Pathuria, Jaltungi, Indra-Puskarini, Mangala, Hadua, Amra Puskarini and Kobesh Dighi. The ponds were dug by the Chauhan Kings of the Bagris. The Sarbamangala temple is the biggest temple located in the northern side of the Mangala Lake, which is a very impressive piece of architecture. You can also find two other temples, namely the Radhaballav temple and the Kameshwar temple, the architectural style of which are similar to the Sarbamangala Temple. Radhaballav temple is a blend of Bengal and Orissa architecture. The temple houses the deity of Radha Krishna, built with black basalt stone. Tourists also flock around the Raghunathji temple or Raghunath Bari. This temple is located in the southern part of Silaboti River. This nine-pillared temple made by Raghunath or the Adi-Malla of Bishnupur is a prime attraction for the tourists. The Gongoni or Gangani gorge od Silabati River also attracts tourist and it is a very popular picnic spot. You can also drive for 20 km. 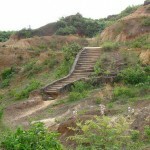 to reach Bishnupur to savor the breathtaking view of the terracotta temples at the site. Things to do in Mandal Pushkarini: Sightseeing is the major activity of the tourists touring to Mandal Pushkarini. You can also explore the region with the help of the locals. How to reach Mondal Pushkarini: Garbeta is located around 250 km. from Kolkata. The region is well connected by road and railway. You can locate Dhadika Bazar, around 5 km from Garbeta and to find Mondal Pushkarini, you need to travel for another 1.5 km. ahead on the NH 60 towards Raniganj. Best time to visit Mandal Pushkarini: Mandal Pushkarini invites tourists all round the year. Lodging and dining facilities Mandal Pushkarini: You will find forest rest house in the destination, offering affordable lodging facilities and decent dining provisions.